Beef noodle soup is so entrenched in the Chinese food culture, I feel like you can find a different version of it almost everywhere you go in the country. Though usually made with shank, brisket, or chuck, the last time I was at home visiting my parents, my mom introduced me to a version made with oxtail. Since oxtail has a lot of fat and connective tissue, the meat becomes very tender when stewed for a long time. It is so delicious. You can usually find oxtail at your local butcher, the veggies and aromatics you can find at regular grocery stores, and for the rice wine, noodles, and chili oil sauce you'll probably have to trek to your nearest Asian grocer. I bought some Lanzhou hand pulled noodles from a market in Chinatown. They weren't particularly "authentic" since they were cut and most likely made by a machine, but I found them to be as close as you can get without making a trip to China. Traditionally, hand pulled noodles are actually just one really really really long noodle. The chef or street vendor will take a slab of dough and keep pulling it over and over again (never breaking the dough at any point) until thin noodles form. It's quite magical to see, they do it so fast that my brain has a hard time registering what I'm seeing and all of a sudden they have perfect noodles (or, technically noodle, singular) going into a pot. Authentic or not, any version of beef noodle soup is delicious. 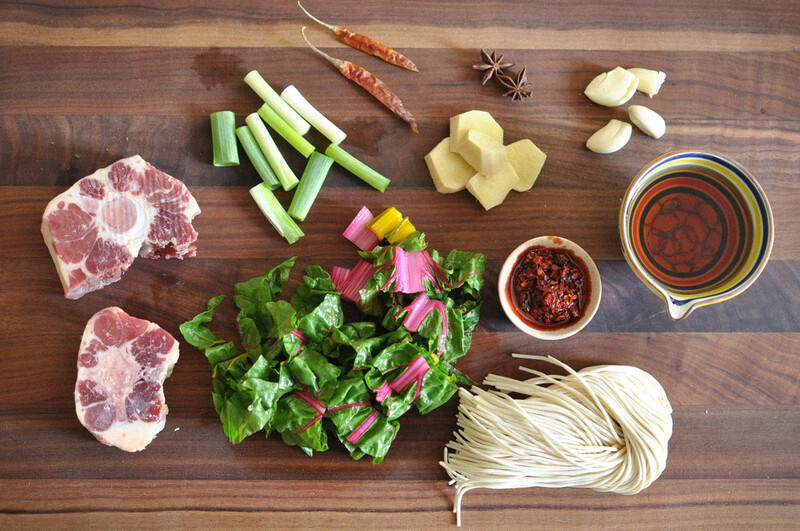 The chili peppers and chili oil topping is essential for making the best noodle soup. However, I know that not everyone likes spicy food, so you can omit them if you prefer. Most recipes for beef noodle soup use up to a cup of soy sauce. I find that to be egregiously unnecessary. Why cover up the flavor of the beef when you should be enhancing it? My mom actually uses no soy and no sugar and I think her version still tastes better than mine. I add just a touch of both since I like the flavor. You can adjust to your liking. If you're planning on having leftovers, cook only as much noodles/chard as you're using the day of and save the excess broth and meat. Then, when making the leftovers, reheat the broth/meat and boil a fresh batch of noodles. Heat up oil in a dutch oven on medium high. Add ginger, garlic, scallions, star anise, and chili peppers. Cook for 1 to 2 minutes until fragrant. Add oxtail and rice wine, stir to combine. Add water, salt, sugar, and soy sauce. Bring to a boil. Turn down heat to medium-low and simmer for 3 hours, partially covered, until beef is very tender. Gently fish out oxtail segments, pull the meat off (or alternatively, keep them whole) and set aside. Strain soup through a fine mesh sieve and return to pot. In another large pot, bring a few quarts of salted water to a boil. Add noodles and cook for 3 to 4 minutes. Add chard and cook for an additional 2 to 3 minutes until the leaves are wilted and stalks are tender. Divide noodles and chard evenly among a few bowls. 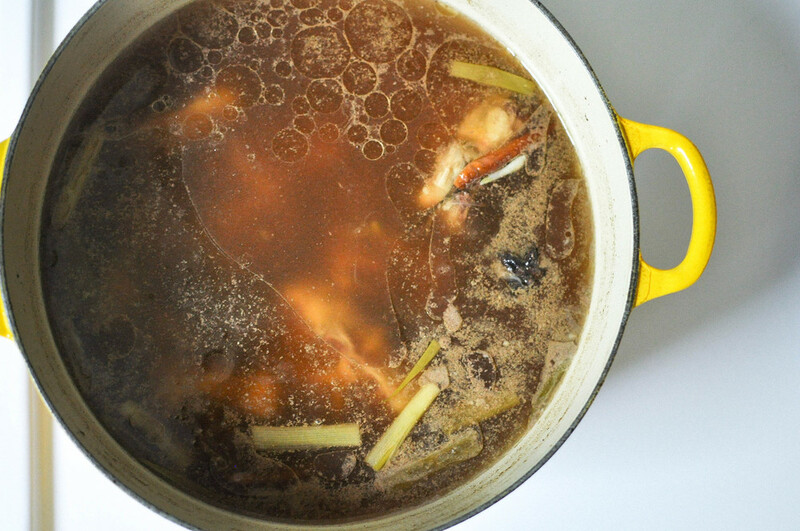 Spoon beef broth into each bowl until noodles are mostly submerged and top with oxtail meat. Mix in a good amount of chili oil sauce, a few drops of soy sauce, and a spoonful of scallions. Slurp up immediately.